FOREIGN RULE A bone analysis suggests that ancient Egypt’s Hyksos dynasty, represented here by palace remnants, gained power via an influx of immigrant women who married into royalty, not a military invasion. CLEVELAND — A mysterious foreign dynasty that ruled ancient Egypt for about a century gained power not by force, as often thought, but by marrying into royalty, new evidence suggests. Hyksos people, thought to have come from somewhere in West Asia, reigned as Egypt’s 15th dynasty from around 3,650 to 3,540 years ago. Although later, homegrown Egyptian pharaohs described these people as invaders, no remains of battles fought by Hyksos people against Egyptians have been found. 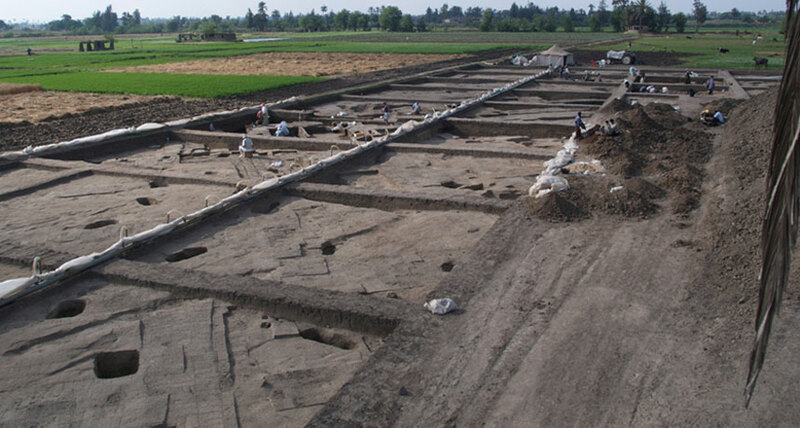 An influx of mostly female immigrants may have occurred at Tell el-Dab’a, the former Nile Valley Hyksos capital, shortly before the foreigners took over. “Hyksos people in Egypt appear to have been an elite group that gained power from within,” biological anthropologist Christina Stantis of Bournemouth University in Poole, England, said March 29 at the annual meeting of the American Association of Physical Anthropologists. She and Bournemouth colleague Holger Schutkowski analyzed strontium in teeth from 71 individuals previously excavated at Tell el-Dab’a. Around half died within a few centuries before Hyksos rule; the rest died during the Hyksos dynasty. Measures of strontium, which gets absorbed into bones by regularly eating local plants and animals, are geographically distinct, indicating regions where people have lived. Twenty-one of 27 females interred in elite graves dating to shortly before Hyksos rule came from outside the Nile Valley, Stantis said. Only a few nonlocal, elite males came from that time period. That female-skewed immigration fits a scenario in which Hyksos women married into Egyptian royal families, she said. Tell el-Dab’a continued to attract high-ranking foreigners during the Hyksos dynasty, she said. About half of elite individuals, men and women alike, who died during its rule had immigrated to Tell el-Dab’a. “This was clearly an international city,” Stantis said. Further strontium studies may locate where foreigners at Tell el-Dab’a came from.